Amish Heirloom Quilt – Just Arrived! It was a long, long, VERY long time coming but well worth the wait. 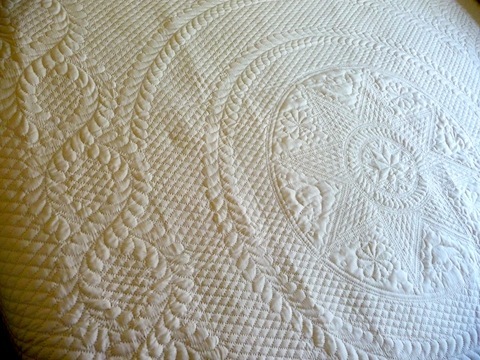 The UPS man showed up with our new Heirloom quilt today! We are proud to present a first for us – a king size Wholecloth Amish Heirloom quilt. We opened up the box, set it up, took a few photos and it hit us. It’s completely mind blowing that, literally in this case, 14 football fields of thread went into the hand quilting of this one quilt! The artist also made it in a squarish format – traditional Amish style (112″ X 113″) – the photos on prior pages are on a king size bed so you can actually see how well it works.